LOS ANGELES (USC PR) — Garrett Reisman, Director of Space Operations at SpaceX and a former NASA astronaut, will be joining the faculty of the Department of Astronautical Engineering at the USC Viterbi School of Engineering. Reisman, who has participated in three space shuttle missions and spent three months on the International Space Station, will join USC as a full-time faculty member on June 1, 2018. At the USC Viterbi School of Engineering, Reisman will teach undergraduate and graduate level astronautical engineering students, and advise the Department and the School on various space-related issues. In addition, he is expected to provide support to the student-run, student-operated Rocket Propulsion Lab and the Liquid Propulsion Lab. Reisman holds a B.S. in Economics and a B.S. in Mechanical Engineering and Applied Mechanics from the University of Pennsylvania, an M.S. in Mechanical Engineering from the California Institute of Technology, and a Ph.D. in Mechanical Engineering from the California Institute of Technology. At SpaceX, Reisman and his team are responsible for mission planning and operations, crew health, Crew Dragon ergonomics and human factors, as well as crew and ground operator training. He and his team also work with NASA to prepare SpaceX’s Falcon 9 rocket and the Dragon spacecraft to take astronauts to space. Reisman will continue on as a Senior Advisor with SpaceX, supporting efforts to bring astronauts to the International Space Station (ISS) from American soil for the first time since 2011. “USC and the students of Viterbi are incredibly fortunate to learn from someone with Garrett’s personal experience, practical knowledge, and passion for space,” said Gwynne Shotwell, SpaceX President and Chief Operating Officer. Prior to his work at SpaceX, Dr. Reisman was an astronaut for NASA. He has flown on the Space Shuttle Endeavour, the Space Shuttle Discovery and the Space Shuttle Atlantis. 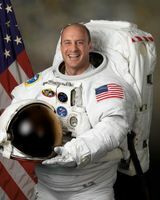 He served with both the Expedition-16 and17 crews as a flight engineer aboard the International Space Station and during his time in orbit, he has participated in three spacewalks. In addition to his spaceflight experience, Reisman trained NASA astronauts in both robotics and spacewalk operations. USC has a strong legacy of innovation in space exploration. The USC Viterbi School of Engineering is one of a core group of top schools with a distinct astronautical program. To date, school researchers have innovated in spacecraft propulsion, space science, space environment, space communications, satellites, and materials. Astronaut Neil Armstrong was a Viterbi alumnus (MS, 1970, Aerospace Engineering), and the school has a dedicated Space Engineering Research group. The school maintains strong connections with pioneering space organizations and alumni who design and build rockets and space launchers, communications and direct broadcasting satellites, navigational systems, crewed space vehicles and planetary probes. “Dr. Reisman brings exceptional expertise to astronautical engineering at USC. Our flagship Master’s program is among largest in the nation and it already offers unique coursework related to human spaceflight. The U.S. national space program now embarks on human exploration beyond low earth orbit. This is a strategic development for the country and for the world. With Garrett’s unique knowledge and enthusiasm, we will contribute in an important way to educating the new generation of rocket scientists and help enable this ambition,” said Mike Gruntman, Chair of the Department of Astronautical Engineering.